RETHINKING LA - 45 years ago, Mayor Sam Yorty’s Charter Reform Commission presented a draft of a new City Charter which included the creation of a system of elected neighborhood councils with advisory powers, a proposal that was summarily rejected by the Los Angeles City Council. 30 years later, the State of California eliminated the Los Angeles City Council’s power to veto secession measures and City Hall suddenly found itself motivated to embrace a vision of a responsive government that delivers city services efficiently and with oversight and accountability. It took the threat of secession and the will of the people but this simple mandate has resulted in a current roster of 95 neighborhood councils, including Wilmington and Coastal San Pedro which are approaching their 10th birthdays on December 11, 2011. Along the way, neighborhood councils have struggled to find their place in a city that has a track record for rejecting oversight and advice. Some neighborhood councils floundered, some prevailed, and some raised the bar so significantly they may have even threatened the status quo at City Hall. In fact, in many cases, neighborhood councils have taken on the role of shadow government, filling the gaps that come from the uneven distribution of city services. The Downtown Los Angeles Neighborhood Council has gone beyond simply advocating and advising on issues that include sustainability, open space and homelessness. They have taken a lead position on developing a Complete Streets standard for downtown, assuming the role of the Transportation Department in embracing a policy that comes with both federal and state mandate. The Woodland Hills-Warner Center Neighborhood Council has gone beyond simply commenting on city council motions and advising the council office on traffic, utility rates, and parking. They have taken a lead position on engaging the community in the development and implementation of the Warner Center Specific Plan, complete with outreach that includes mailers and town halls. They have assumed the role of the Planning Department and they offer the public a better opportunity for public participation than City Hall. The Mar Vista Community Council has gone beyond simply posting Community Impact Statements on City Council motions that include City Hall Google accounts and Arizona boycotts. Their Green Committee has set a standard for sustainability that could serve as the blueprint for the Mayor if he were to get serious about his commitment to making LA the Greenest big-city. They’ve assumed the role of Environmental Affairs and their record of accomplishment ranges from the Wise Water Expo to the Green Gardens Tour to campaigns to ban plastic bags and styrofoam. Along the way, neighborhood councils around the city have defined themselves within the parameters of the Charter mandate, some are highly specialized and formal, some are looser and more social. Some are highly functional and some struggle to overcome organizational challenges. In many ways they are completely unique and yet they have much in common. One thing neighborhood councils share is the judgment that critics levy on the group of 95 councils based on the actions or inactions of the few. While the LAPD administers its billion dollar annual budget amidst City Controller charges that its “business functions are stuck in the 1950s," the City Council can still find time to debate the intricacies of managing a neighborhood councils $40,500 annual budget and the implications of purchase orders vs. debit cards. While the LADOT is taken to task by the City Controller for losing track of its arsenal of 36,000 parking meters, resulting in a lack of oversight on the collection and depositing of meter revenue, the City Council can still find time to pontificate on the proper inventory control procedures for neighborhood council office equipment. While the City Council gets taken to task in the California Court of Appeal for exceeding its authority, resulting in a reversal and the conclusion that “the City Council abused its discretion by failing to proceed in the manner required by law,” the City Attorney [link] finds time to audit neighborhood council elections and ponder the impact of the City Council created “factual based stakeholder” designation. Neighborhood councils have been taken to task for their failure to aggressively engage the public and in many cases that’s a fair charge. But volunteers working with a limited budget can’t be expected to exceed the performance of City Hall and its $6.9 billion budget and yet they do. Neighborhood councils have been criticized for keeping sloppy books and in many cases that’s an accurate appraisal. But volunteers, picking up where another volunteer left off, sometimes lose receipts yet their record exceeds the LAPD which was found to be missing receipts in 56 percent of audited transactions totaling $2.6 million. 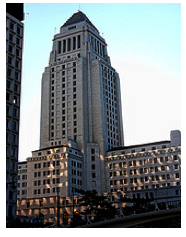 Neighborhood councils have been taken to task for failing to demonstrate a comprehensive proficiency of Ethics laws, Brown Act requirements, and California Public Records Act standards yet City Hall allows the individual departments to post their unique interpretations of the law on their websites, demonstrating that the real need for training is at City Hall, not in the community. Through it all, neighborhood councils continue to plod along, contributing money to the Department of Transportation for Sharrows, to Rec and Parks for events and maintenance, to the LAPD for tactical gear and somehow that meager budget continues to generate the attention of City Departments who can’t manage to get by on their own budgets. While the merits of neighborhood councils giving their money to other city departments continues to draw great debate, the real work of neighborhood councils has shifted from simple advice and oversight, now taking on the role of Shadow Government. Neighborhood Councils are the Planning Departments, they are the Transportation Departments, they are the Rec and Parks Departments, and they are the Sanitation Departments to their communities. They have become the de facto City Hall in a city that sees the delivery of city services as an optional benefit when it should be the purpose of City Hall. The discussion over the purpose of neighborhood councils and the role of volunteers in the future of LA is sure to ruffle feathers, but that’s an indicator of the importance of this debate. One of the greatest opportunities to engage in this great dialogue is on September 24th when the 2011 LA Congress of Neighborhoods takes place at City Hall. There will be 21 workshops, all designed by community leaders, ranging from basic topics for new board members to advanced sessions for experienced members. The LA Congress of Neighborhoods is free, it’s open to the public, and it includes breakfast and lunch! Register and then make plans to join community leaders from all over the city in planning for the future of our city.